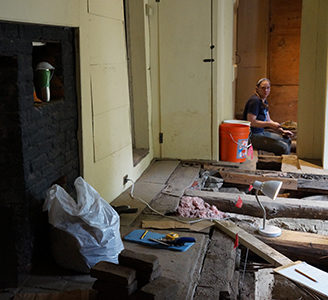 Well, folks, today was the last day of excavations at the Parsons House and what a productive day it was! Although it was looking iffy for a moment, we were able to finish all of our excavation units. We also made a few more interesting finds as well. We found a lice comb from one of the units inside the house and a bone-handled toothbrush from one of the units outside the house. This tells us a little about the hygiene practices employed by the residents of the house and how they dealt with hygiene problems in general. All of our units have been dug down to sterile soil, soil that does not yield any more artifacts. One of our units reached a depth of 126 centimeters! We thought we may have lost Linda in that pit once or twice! After the digging ceased, we were charged with the task of drawing what we call profile drawings. Because the walls of our units are completely straight, we are able to see the different layers, or strata, of soils. Those layers are carefully plotted and drawn on graph paper to scale and the soil colors and textures are also recorded. Knowing about the soils that we are digging in can help us interpret the artifacts that are coming out. 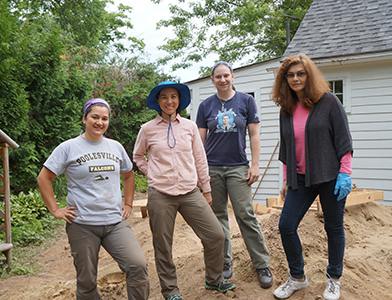 Linda, Mary, Elana, and Jill would like to profusely thank all the dedicated volunteers, archaeologists and friends that so generously donated their time to expedite this process. We also thank all the school children that did such an amazing job of helping us reach our research goals from Leeds Elementary, Ryan Road Elementary, the Pioneer Valley Chinese Immersion Charter School and Northstar. We definitely thank our families for being so patient while we were so busy working and last, but certainly not least, we would like to thank all the visitors from Northampton and surrounding areas for supporting our work and coming out to visit us. Thank You All!!! 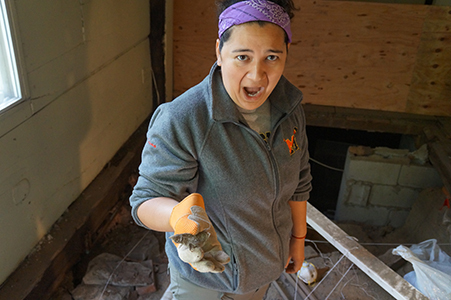 Elena reacts for us all when she discovers a mummified mouse. Jill hard at work excavating in the buttery. 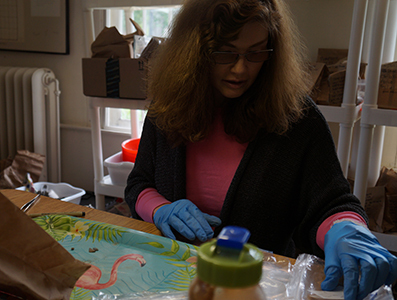 Mary sorting artifacts in the lab. (Left-to-right) Elena, Linda, Jill, and Mary.